If you’re looking for the easiest drone to fly with the most flight time, features and great video quality, the Phantom 3 is the only option that I would recommend to just about anyone. There are a few other drones that have similar functionality to the Phantom 3, but nothing else is going to give you a great all around experience with all of the most popular features for the same price. Right now, the Phantom 4 is what I fly the most (when I’m not flying the inspire 1), but the Phantom 3 was my favorite camera drone before the Phantom 4 came out and it’s still better than any other option in it’s price range. I used to tell people to buy a smaller drone so that they could learn how to fly before investing in a Phantom, but now ​with better flight characteristics and the built-in flight simulator, there really isn’t a reason to do that anymore. One thing that isn’t immediately apparent is how large the DJI user community really is. Compared to other drones, the amount of YouTube videos, websites and people in general talking about the Phantom 3 is huge. Any questions that you might have, there will always be someone out there who knows the answer. You can also find after-market accessories for sale like carrying cases, lens filters, GPS trackers and more. When I flew the Phantom 3 for the first time, all I could think was “this thing flies like a mini Inspire 1!”. It’s much more stable than the Phantom 2 and the video quality is exactly the same as the inspire 1, however there are some big differences between them. If you aren’t sure which one to buy, read this article comparing the two. The Phantom 3 comes in four different models. At the top of the food chain, DJI’s Phantom 3 Professional comes standard with follow-me, GPS waypoints, point-of-interest, optical-flow and ultrasonic sensors (for hight and position hold when no GPS signal is available), 4K video recording, 20 minute flight times and more. The Phantom 3 Advanced will do everything that the Phantom 3 Professional can do, but at 2.7K instead of 4K. 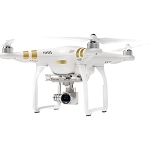 At $499, the Phantom 3 Standard is the cheapest Phantom 3 you can buy. It has a cheaper controller design (taken from the older Phantom 2), no optical-flow or ultrasonic sensors, but it still has follow-me, GPS waypoints and shoots 2.7k video. 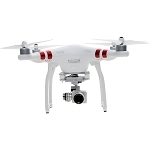 With the Phantom 3 Standard, you’re basically getting something comparable to a 3DR Solo with a GoPro Hero 4 Silver and gimbal for half the price. The last model which came out a few months ago is the Phantom 3 4K. It has the ability to shoot 4K. but at the same price as the Phantom 3 advanced.